Racing Hero: Bill Elliott - he's Awesome Bill from Dawsonville! Crew: Mom & Dad, Dave, Mark, Jared, Andrew, Chad, Bill Dan, Jay, Jon. Sponsors & Support: Midwest Seed Genetics, Taste of Texas BBQ - McCook, NE, American Flea Market - Denison, IA, PBR Chassis. 1995 - 3 Econo Stock wins at Crawford County Speedway, 1995 Econo Stock Track Championship. 1996 - Crew Chief of the Year Award for #42 Dave Plowman with 7 wins, and #9 Mark Plowman with 2 wins. 2005 - IMCA Modified SCS Rookie of the Year Award. 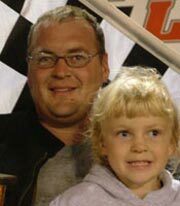 2006 - 4th in IMCA Modified Shelby County Speedway Points with 2 Feature wins and 6 heat race wins. 2007 - 1 Feature win, 5th in SCS Points. 2008 - 5th in SCS Points. 2009 - 7th in SCS Points with 2 heat race wins. 2010 - Tiny Lund qualifier with Top 10 finish. 1994-1995 - Econo Stock at CCS. 1996-1998 - Pro Stock at CCS. 2003-2005 - IMCA Limited Late Model at SCS and Blackbird Bend. 2004-Current - IMCA Modified at SCS, CCS, Blackbird Bend, and McCook Speedway. Win every race! Have fun doing it! I'm more nervous watching my brothers race than when I'm racing my car.